Message: I'm interested in the M600 product. 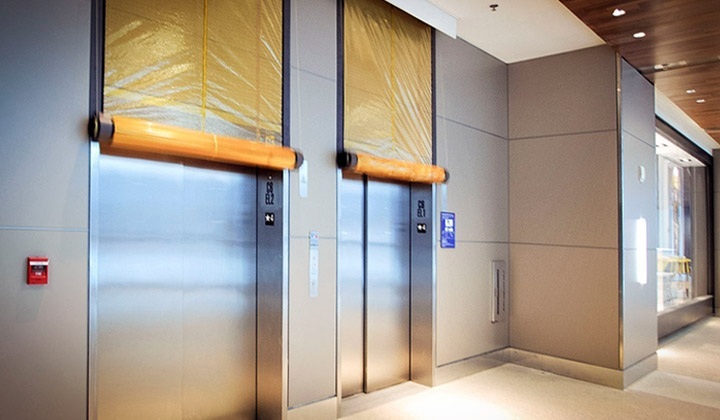 For fire protection engineers who want to provide architects with the utmost freedom when designing elevator lobbies, the M600 Smoke Curtain is an ideal solution. The dimensions of the M600 are fully customizable, which allows it to seal nearly any opening. Standard returns available: 1/2 inch, 3/4 inch and 1 inch. Custom returns available. External indicators will display if a fault is detected including; a partial curtain deployment and blinking LED status indicator lights on housing edge to aid building maintenance personnel in quickly diagnosing system faults. How is the Smoke Guard system M600 listed and labeled? What is a "head mount"? 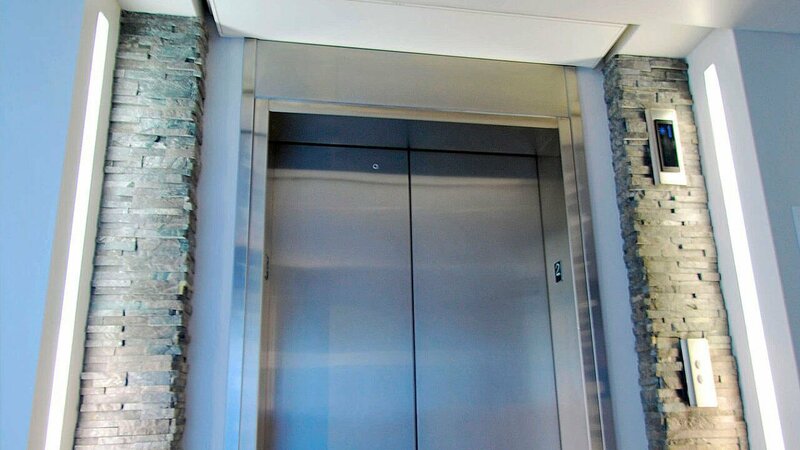 A head mount is a Smoke Guard system (SGS) housing is mounted directly above the elevator door frame. What is a "high mount"? A high mount is a Smoke Guard system (SGS) housing is mounted in ceiling or valence above the top of the elevator door frame. What is a "ferrous metal" frame? A magnet will adhere to or be attracted to a frame constructed of ferrous materials. Iron and steel are examples of ferrous materials. The Smoke Guard system (SGS) curtain requires a 2-inch wide continuous flat ferrous metal surface for deployment. Stub rails are short versions of our full-length ferrous metal rails used to span the distance between a ferrous metal elevator door frame and the bottom of a Smoke Guard System (SGS) housing to maintain the continuous ferrous metal surface required for system deployment. What is a "side mount"? Do all Smoke Guard system models offer this solution? A "side mount" configuration allows the Smoke Guard System (SGS) motor to be mounted on the left or right side of the housing. This configuration allows the units to be installed into conditions that require lower clearance from mount height to structure above. The SGS Model 600 is the only unit currently available in this configuration. Does the Smoke Guard system interfere with elevator door operations? No. 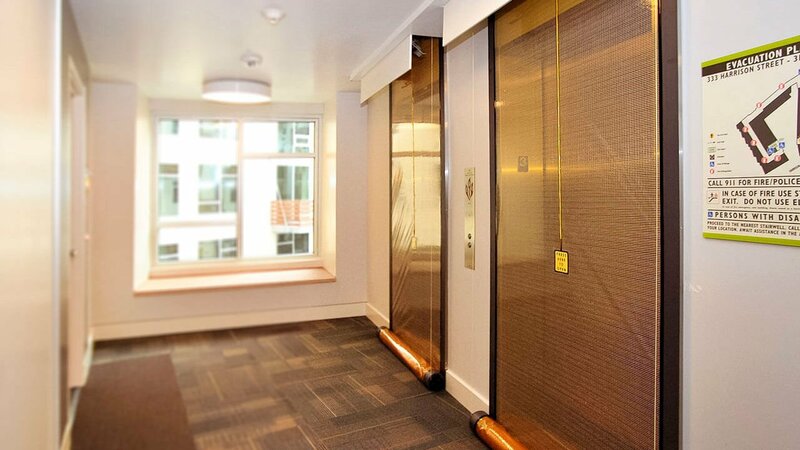 The Smoke Guard system (SGS) provides a smoke- and draft-control assembly for the fire-rated elevator door frame. The SGS is a smoke resistant gasket mounted on the face of the elevator doorframe which allows the elevator to function without interfering with elevator door operation. How does the unit deploy in the event of a fire? The release mechanism of the Smoke Guard system (SGS) is connected to a UL listed smoke detector (UL Standard 268) required by code at the elevator landing. When smoke is detected, the release mechanism activates SGS deployment. The SGS curtain covers the elevator openings on the floor where smoke was detected. What does "return" mean when I am specifying the Smoke Guard system? 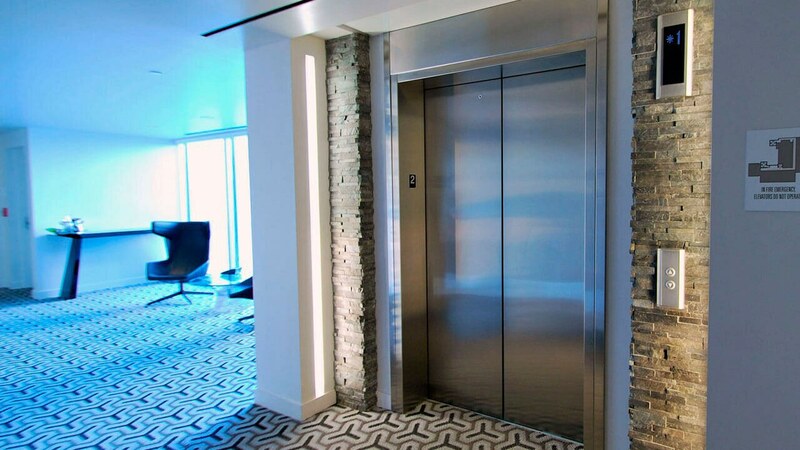 We refer to the depth or distance between the wall and the face of the elevator door frame as a "return". Model 200 has specific returns associated this system, consult your local SGS distributor or SG Customer Service on return sizes for your project. Does the curtain stop if someone or something gets in the way while it deploys? The Smoke Guard system (SGS) Model 200 is a fail safe device that is gravity deployed. This unit will stop only when the curtain assembly encounters the floor. Is there a Smoke Guard system model that provides monitoring and supervision capability to provide consistent operational status of the unit? Yes, the Smoke Guard system (SGS) Model 600 has the ability to continuously check the circuits involved to assure that the screen will release properly. What kind of warranty is provided by Smoke Guard, Inc.? When does the official warranty period begin? Smoke Guard, Inc. provides a one-year warranty for the Smoke Guard system (SGS). The warranty period runs twelve months from the date that the project in which they are installed is turned over to the owner. What is the recommended maintenance schedule for the Smoke Guard system? Each Smoke Guard system (SGS) unit should be exercised once every six months to verify deployment of the screen. © 2019, SMOKE GUARD, INC.